Amritsar: A co-ordination committee of various US based Gurdwara management committees and Sikh diaspora organisations have called upon the Sikh community to completely boycott October 25 event to be held by Rashtriya Sikh Sangat, a wing of Hindutva fountainhead Rashtriya Swayamsewak Sangh (RSS). The Rashtriya Sikh Sangat was declared as anti-panthic outfit by Akal Takht Sahib in July 2004. The Akal Takht Sahib had further asked Sikhs to not to extend any sort of support to this group. The Akal Takht had noted in its official Sandesh that the activities of the Rashtriya Sikh Sangat were aimed at inflicting harm on the Sikh Panth after infiltrating in the Panth. Rashtriya Sikh Sangat has announced to hold a Samagam on October 25 at Delhi’ Talkatora Stadium under the guise of marking 350th Parkash Gurpurab of Guru Gobind Singh Ji. The Sikh Co-ordination Committee comprising representatives of around 85 US based Gurdwara management committees and Sikh organisations said that the intentions of the pseudo Rashtriya Sikh Sangat were clear and this group was working on the lines of it’s Hindutva patron to assimilate the Sikh Panth into Hindutva fold. In a statement issued on Sunday (Oct. 22), S. Himmat Singh, Kewal Singh, Harjinder Singh, Veer Singh and Davinder Singh said that Rashtriya Sikh Sangat was exposed on the day of its foundation when on 23 November 1986 it’s head Chiranjiv Singh had declared Sikhs as Hindus. The Sikh diaspora representatives also issued a stern warning to Shiromani Gurdwara Prabhandak Committee (SGPC) and Delhi Sikh Gurdwara Management Committee against extending any help to the anti-Sikh group. “If SGPC, DSGPC or any other Sikh group violates the July 2004 edict of Akal Takht Sahib by extending any sort of help to the Rashtriya Sikh Sangat, the diaspora sections would be compelled take strict decisions” they added. ???? DSGMC asks for clarity on G.Gurbachan Singh’s Statement on RSS !!!! 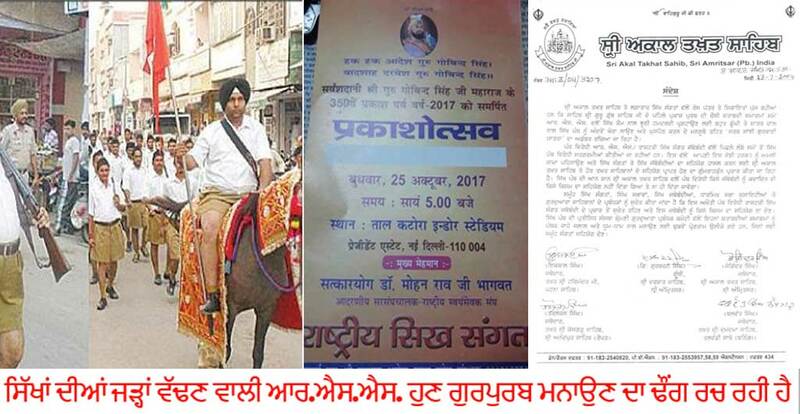 Previous post How Jathedar’s failed to follow the Sikh Tradition on Bandi Chhor ?